Toyota Motor Corporation today announced that it has concluded an agreement with Grab Holdings (Grab) to strengthen their existing partnership and expand the collaboration between the companies in Southeast Asia to further advance Mobility as a Service (MaaS) across the region. As part of this agreement, Toyota will invest $1 billion (Rs 6,317 crore) in Grab. Furthermore, to accelerate decision-making, one Toyota executive will be appointed to Grab’s board of directors and a dedicated Toyota team member will be seconded to Grab to as an executive officer, with Toyota considering more personnel exchanges in the future. Grab operates online-to-offline mobile platforms in transportation, food and package delivery, mobile payments and financial services in 217 cities across eight Southeast Asian countries. In March 2018, it acquired Uber Technologies (Uber) Southeast Asian assets, and is now the leader for ride-hailing in the region. 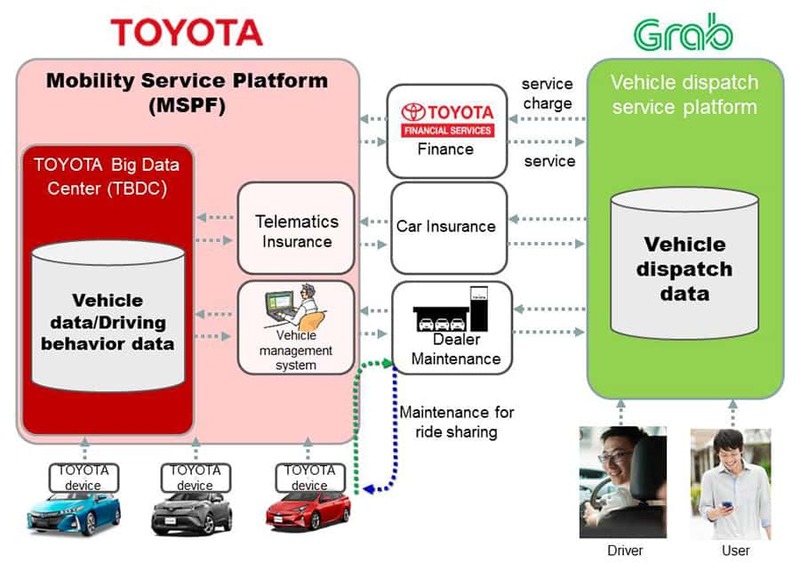 Since August 2017, the partners (Toyota and Grab) have been developing connected services for Grab utilising driving data collected by Toyota’s TransLog data-transmission driving recorder. The recorder, developed by Toyota for corporate fleets, has been installed in 100 Grab rental cars. The data collected is stored on Toyota’s proprietary mobility services platform (MSPF), which serves as a form of information infrastructure for connected vehicles. Both companies have already begun collaboration in the field of connected vehicles by, for instance, providing driving-data-based automotive insurance for Grab’s rental fleet in Singapore through local insurance companies. The partners state their initial success has led them to expand their collaboration. This expansion is aimed at achieving connectivity for Grab’s rental car fleet across Southeast Asia, and at rolling out various connected services throughout the region that utilise vehicle data stored on Toyota’s MSPF. In addition, collaborations in driving-data-based automotive insurance, financial services for Grab drivers and maintenance services are also contemplated under the new partnership. Through this new agreement, Toyota and Grab plan to shift into full-scale implementation of services they have been developing to customers in Southeast Asia. The partners will also look for future collaborations aimed to achieve more-efficient ride-hailing businesses and for developing future mobility service solutions and Mobility as a Service vehicles. Commenting on the new development, Pinar Ozcan, professor of Strategic Management at of Warwick Business School, who researches the sharing economy, said: “The latest news of Uber’s Asian rival Grab receiving $1 billion investment from Toyota is proof that the sharing trend is here to stay. Daimler investing in car sharing company Turo and GM preparing to launch its own car sharing service (Maven) are other contemporary examples. “As we are going more and more towards a future dominated by Connected, Autonomous, Shared and Electric (CASE) cars, auto manufacturers are realising that making cars for private ownership will not let them survive in the long run. Have an article on Business Mobility as a Service? Submit it to us through our contact form.